Wednesday night might have been the most fun the Bethany women’s basketball team had had all year. Not only did the Swedes exit Stuart Fieldhouse with an 84-55 win, but they have built some momentum with back-to-back wins. Both teams exchanged buckets early before the Swedes got out to an 11-3 lead midway through the first. A couple of Erin Richardson 3-point makes put the Swedes up 19-12 after one. Bethany’s most dangerous shooter, Kelsi Mueller would get in to the act in the second quarter, as the Swedes’ Junior hit a couple of perimeter shots–including a 35-foot heat-check nothing but net three to really get the offensive mojo going. The Swedes led 37-26 at halftime. Southwestern was still battling in the second half. Every time the Swedes would build a 14 point lead, the Moundbuilders would cut it back down to single digits midway in to the third quarter. That’s when Bethany finally ran away with it. The Swedes would start the final stanza on a 13-4 run to build their lead to 20-plus points and cruise on their way to a road win. Southwestern (3-17, 2-13 KCAC) was outscored 22-8 in the final quarter. The Builders were led by both Jazmyne Laskey and Marissa Evans with 11 points each. Ashley Carrillo added in 10. Bethany (10-9, 7-7 KCAC) has won two-in-a-row after knocking off York last week. Mueller had a monster game for the Swedes, going 4-4 from 3-point land and finished with 18 points. Sena Atkius had one of her best games as a Swedes scoring 15 points and Richardson tallied in 13. Bethany next travels to Ottawa this weekend. The 10th-ranked team in the land had no problems dispatching Bethany on Wednesday night, taking the lead early and never looking back. Southwestern got up 21-11 and the wheels fell off for Bethany. Mookie Duncan picked up two fouls in the first three minutes and had to sit on the bench the rest of the first half which didn’t help matters either. The Moundbuilders’ Cameron Hunt had himself a ballgame, going 10-19 from the floor, 3-5 from 3 and 9-9 from the FT stripe. Southwestern, which was coming off of a loss at Ottawa on Monday, appeared focused from the opening tip. Bethany’s Tyler Larkin did all he could do to keep the Swedes in the game, but it was too much Jinx the Cat and Southwestern to sink Bethany to another loss. Southwestern (17-2, 13-2 KCAC) swept Bethany on the season series. Hunt had a spectacular double-double performance scoring 32 points and handing out 10 assists. Andrew Hamm scored 15 points, while Troy Baker helped with 10. 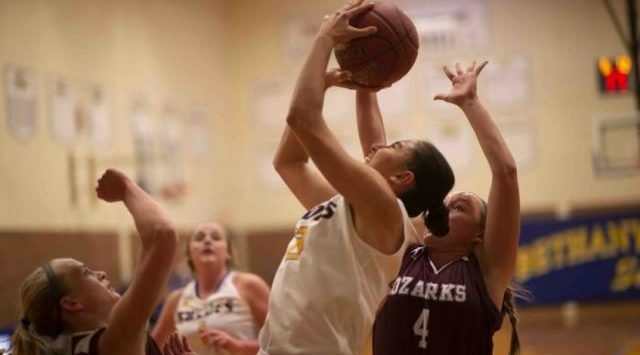 Bethany (9-10, 6-8 KCAC) was out-rebounded 43-29 on the night. Larkin led the way with 20 points. Duncan tallied 16 for the Swedes.